As development has changed Windham, Clark Farm has been a mainstay for preserving the scenic and agricultural character of the town. Now a portion of the farm is permanently conserved, not only for farming, but also for recreational access, sustainable forestry, and wildlife habitat. 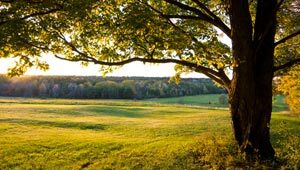 The Trust for Public Land has been working with Maine Farmland Trust (MFT) and the Windham Land Trust (WLT) to conserve Clark Farm since 2008. In March 2011, TPL purchased 217 acres of Clark Farm and an agricultural easement to keep the land working. MFT is seeking a new farmer as part of its Buy-Protect-Sell program. The land also creates an immediate link in the Windham Land Trust’s vision for a protective corridor along the Black Brook. Access to this portion of Clark Farm will come from the Black Brook Preserve to the north, and Mountain Division Trail to the west. Utilizing Land for Maine’s Future and federal Farm and Ranch Land Protection Program funding, this Clark Farm partnership sustains Windham’s agricultural legacy, enhances public access to the Black Brook, and creates a new local farming opportunity.